We believe the values and skills learned early on are vital building blocks for life. Because of the Y, more young people in neighborhoods around the nation are taking a greater interest in learning and making smarter life choices. At the Y, teens learn values and positive behaviors and can explore their unique talents and interests, helping them realize their potential. 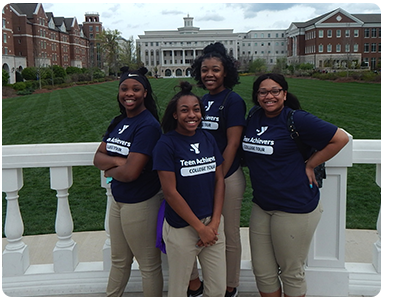 The YMCA’s Teen Achievers program provides students with inspiration and guidance in setting goals to graduate from high school. Through vital partnerships with area high schools, Teen Achievers teaches students to believe in themselves and strive for success. Teen Achievers meets weekly in your school, from October through May. Additional programming is offered on select Saturdays. Friendship, fellowship and much more!